Bolivia's tropical rainforests, hot plains, and cold mountains house all manner of mammalian biodiversity. A Vicuna mother with her young one on the Bolivian Altiplano near the Andes Mountains. Bolivia has a great variety of organisms and ecosystems, and is one of the countries forming part of the Like-Minded Megadiverse Countries list. The country’s altitude levels, varying between 90 and 6,500 meters above sea level, facilitate a vast biodiversity. Bolivia comprises of four types of biomes making up 32 ecological regions and 199 ecosystems. Within the regions are several national parks and game reserves, including the Madidi National Park, the Noel Kempff Mercado National Park, and the Eduardo Avaroa Andean Fauna National Reserve, among others. The country has over 3,000 species of animals including 400 mammal species, 200 amphibians, 630 fishes, 270 reptiles, and 14% of the world’s known birds’ species. Some of these native mammals of Bolivia are looked at below. The woolly giant rat, scientifically named the Kunsia tomentosus, belongs to the group of species of burrowing rodents of South America. It is the largest living species of Sigmodontine rodent. The woolly giant rat has short limbs with powerful claws. The size of this rat ranges from 19 to 30 centimeters in head-and-body length, while the tail is relatively short and scaly. The body weight varies from 240 to 630 grams. The body is covered with a dark gray to brown thick and coarse fur. The ears are relatively short and rounded while the female has four pairs of teats. The woolly giant rat is omnivorous, feeding mainly on termites and roots of grass. They spend most of their time in burrows and breeds twice a year. The Bolivian grass mouse, scientifically named Akodon boliviensis, is a rodent belonging to the family Cricetidae. It occurs in the South Central Bolivia and Southeast Peru, and it is “least concern” according to the International Union for the Conservation of Nature (IUCN) because of its wide distribution, especially in the protected areas and its tolerance to habitat modification. The Bolivian Grass Mouse ranges from 5 to 8 centimeters in body length and is around 7 grams in weight as an adult. The body is covered with a brown fur with a white underbelly while the tail is relatively short and is sparsely furred. The Bolivian Grass Mouse is omnivorous, feeding mainly on insects and tender shoots. It inhabits grasslands and shrublands living in holes at the bases of shrubs. 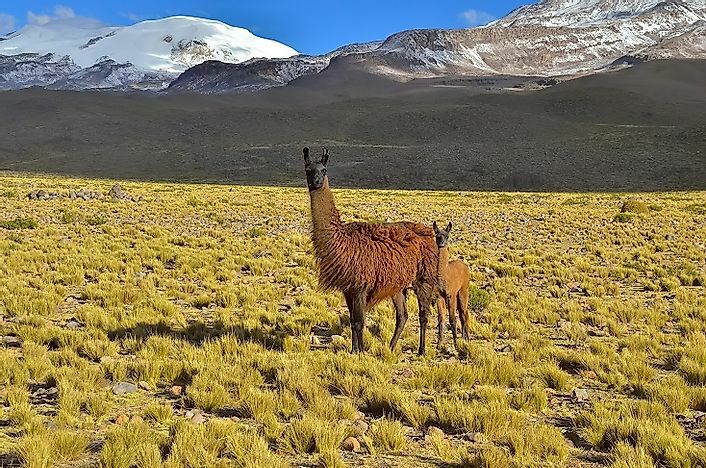 The Vicuna, known as the Vicugna vicugna in the scientific world, is one of the wild South American camelids found living in the alpine areas in and around the Andes. It is native to Peru, Argentina, Bolivia, and Chile but it has also been introduced Ecuador. Bolivia has the largest numbers of Vicunas. It lives at an altitude of 3,200 to 4,800 meters above the sea level and feeds on the mountain during the day and spends the night on the slopes. The Vicunas are delicate and graceful. They have a tawny brown woolly coat on the back and a long white throat and chest. The body length ranges from 1.45 to 1.60 meters while the weight is from 35 to 65 kilograms. The Vicunas are shy, and they have extraordinary hearing. Their diets consist of grass which grows in clumps on the ground. They are family based with each family made up of 6 to 15 adults and their young ones. The Vicunas mate in March to April with a gestation period of 11 months. Certain native species of mammals in Bolivia are being lost faster than natural extinction rates due to the unsustainable use of the natural habitats for these species by humans, invasions by alien species, climate change, and the pollution caused by human activities. With the increasing Bolivian population, the future of its mammals’ habitats remains uncertain. Even though conservation measures including declaring some habitats as protected area, more still needs to be done to secure the future of these mammals and other animal species in Bolivia.